The two iconic artists released an island-flavored collaborative album, 44/876 on April 20. 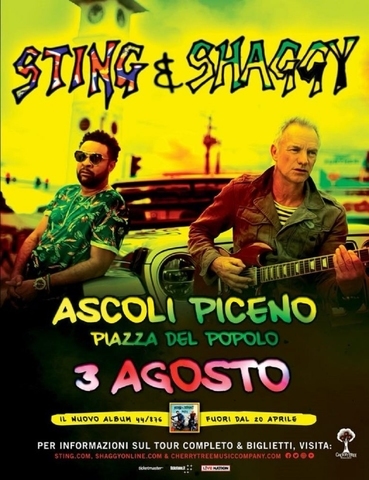 Sting and Shaggy announce three new concerts in Italy: the two iconic artists will perform on August, 3 at Piazza del Popolo in Ascoli Piceno, the following day at Piazza della Cattedrale in Trani and on August, 5 at Arena della Regina in Cattolica. Tickets for the shows will be available for purchase for Sting.com members starting Monday April 23rd at 10am. The general on-sale will start Tuesday, April 24 at 11am at www.ticketmaster.it, www.ticketone.it and in all official selling points. The two iconic artists will also perform in Italy this summer on July, 26 at Forte Arena in S.ta Margherita di Pula (CA), on July, 28 at Auditorium Parco della Musica (Cavea) in Rome, on July, 29 at Arena di Verona, on July 30 at Etes Arena Flegrea in Naples and on August, 1 at Teatro Antico di Taormina. The pair initially joined creative forces to record their new song "Don't Make Me Wait" - a tribute to the Caribbean sounds that influenced them both - and ended up recording an entire album full of joy, melody and uplifting music. They'll be extending this collaboration to the road with a combined band including Sting’s players Dominic Miller (guitar), Josh Freese (drums) and Rufus Miller (guitar)and Shaggy’s musicians Monique Musique (backing vocals), Gene Noble (backing vocals) and Kevon Webster (keyboards).